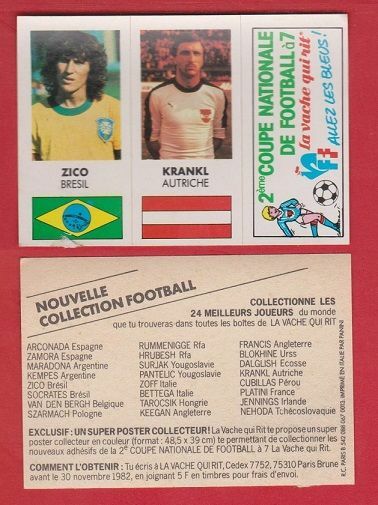 Foreign issue football card stickers, issued by La Vache Qui Rit for the 1982 World Cup under the Nouvelle Collection Football series. Measures approximately 5.3 x 7.8cm. 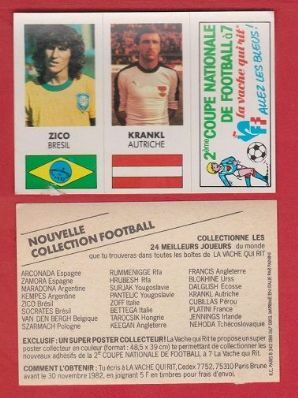 Depicting the Brazil, Flamengo and Udinese star Zico and Austria, Rapid Vienna, Barcelona and Austria Salzburg star Hans Krankl. Small amount of damage at the bottm of the Zico sticker otherwise in very good condition.